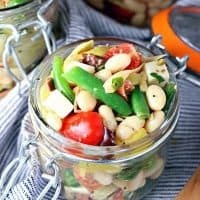 ITALIAN BEAN SALAD — A healthy, protein packed salad featuring two kinds of beans, pepperoni, cheese, artichoke hearts, peppers and an Italian vinaigrette. I love a good salad! Especially in the summer months when I don’t want to turn on the oven. 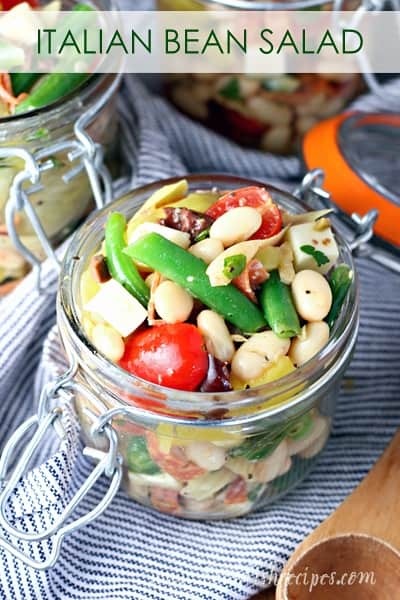 And this Italian Bean Salad makes the perfect summer side or light lunch any day! This gorgeous salad features two kinds of beans–green and cannellini–plus lots of veggies like tomatoes and artichokes. Add a handful of fresh herbs and a homemade vinaigrette and this salad is just about perfect! I love keeping a protein packed salad like this in the refrigerator for lunch, and it’s also a great option for taking to lunch at the office. This salad keeps well in the refrigerator for several days, so it’s perfect for lunch on the go. It’s also a great picnic salad, since their aren’t any mayonnaise based dressings to transport. 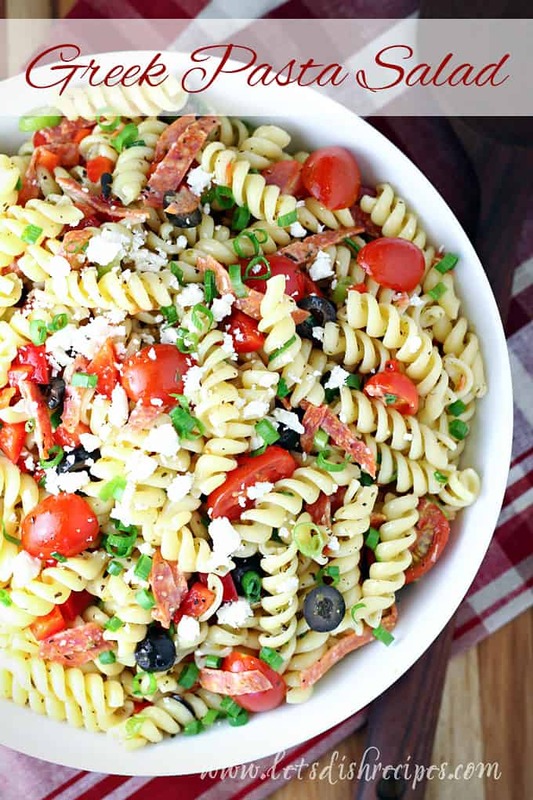 Bring along a loaf of crusty bread and you’ve got a perfect summer meal! 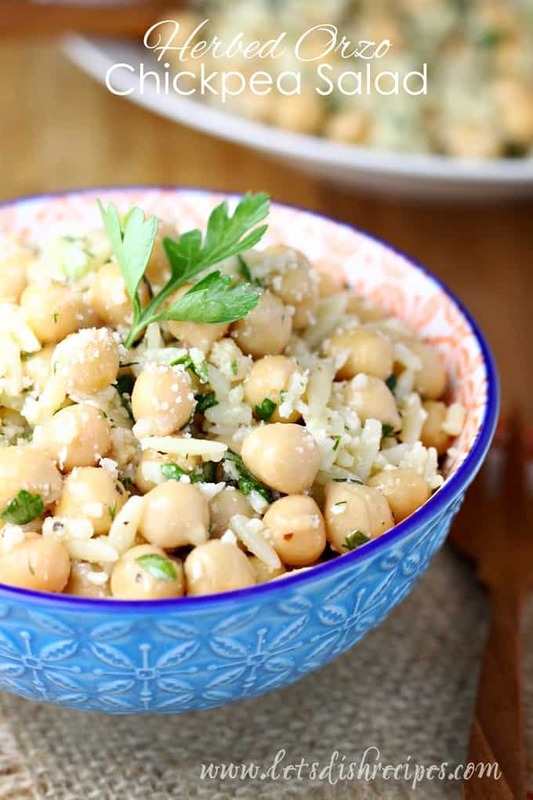 I love that this salad is so versatile! Swap the pepperoni for salami, use a different kind of cheese, or add in some roasted red peppers for variety. 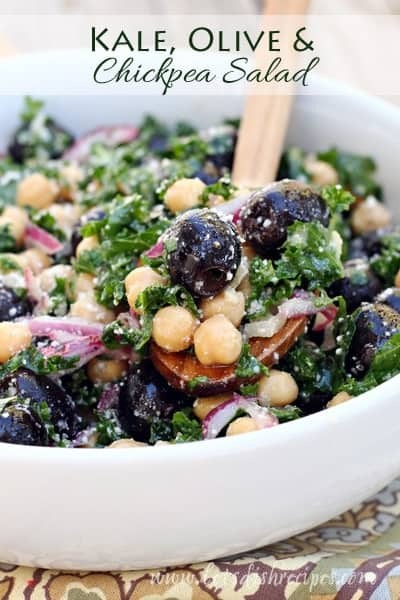 I usually get olive tapenade from the cheese counter at my local grocery store, but you can also use some finely chopped olives and a handful of capers in a pinch. No matter how you mix it up, this salad will be a hit at home, or at any summer barbecue or potluck. And it’s a great way to use all those fresh veggies and herbs from your garden. This one is definitely a keeper! 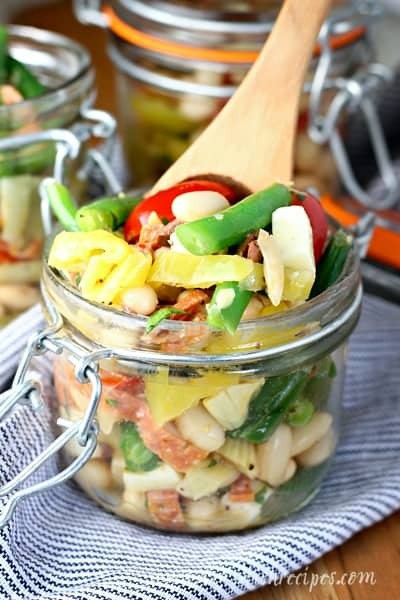 Be sure to save this Italian Bean Salad recipe to your favorite Pinterest board for later. A healthy, protein packed salad featuring two kinds of beans, pepperoni, cheese, artichoke hearts, peppers and an Italian vinaigrette. Blanch the green beans in boiling water until just tender, 3-4 minutes. Transfer to a bowl of ice water; drain. Combine the remaining ingredients in a large bowl. Add green beans and toss to mix. Stir in vinaigrette and mix gently to coat.